Petja is one of those talented make up artists that continue to grow and explore new techniques. I really respect people like her so it was great honor to do this collaboration. The Rocky Horror Picture Show is apparently one of those cult movies that everyone knows about … except me of course. I guess I should have been more of a MAC fan as they did a whole collection about it, but no, first time I heard about this movies was when Petra suggested it as an inspiration. Dr. Frank-N-Furter was the “source” for me. Quite frankly, the thing that got stuck most in my mind was his corset from the beginning of the movie. It was all shiny and sparkly and I wanted nail polish like that right now. I dedicated my accent finger to the corset. Catrice Black To The Routes – base (1 coat). Loved the nail polish, but the brush is still one huge disaster. What would tie up this “look” would be hand drawn corset strings. 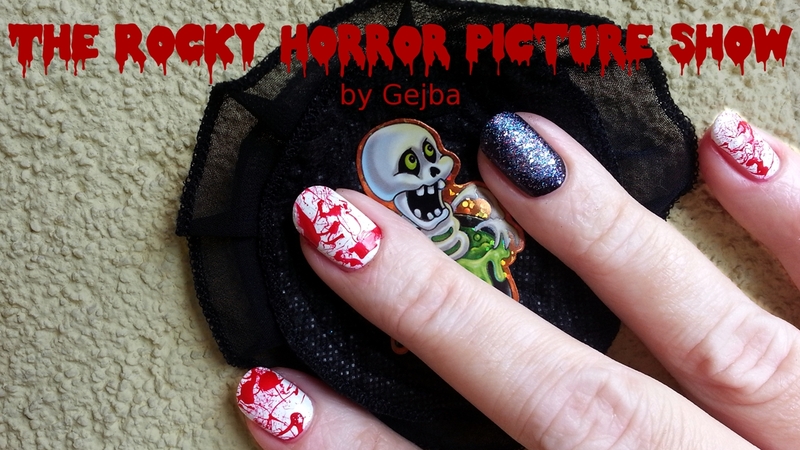 I’ll probably be adding white ones on the actual Halloween manicure. It just seems as a nice touch. And then … let the nail polish remover do its magic. I protected the skin with oils on the first day and experimented on take 2, but cleanup was not as horrible as I feared. Straw must not be too long or short. Thicker worked better for me. Dipping straw in nail polish was my preferred method, but I had to tap excess onto the paper towel. Even if splatter didn’t cover whole nail … leave it. I just made things worse with going in second time. Wait for very long time before you apply top coat. This time I leave you with Petja’s makeup and hair tutorial. You can find all the details in her Rocky Horror Picture Show – Magenta Makeup & Hair post. Next articleAfter more than a year … can I still do it? Love it!!! This mani is sooo cool. Thanks for sharing the tutorial.